Image courtesy of Deepwater Canyons 2013 - Pathways to the Abyss, NOAA-OER/BOEM/USGS. DEEP SEARCH was launched in September 2017 as a multi-agency 5-year study of deep-sea coral, canyon, and gas seep ecosystems in U.S. federal waters of the Atlantic Ocean, including offshore Virginia, North Carolina, South Carolina, and Georgia. The goal of the study is to augment the ability to predict the location of seafloor communities off the Atlantic coast of the Southeast US that are potentially sensitive to natural and anthropogenic disturbances. 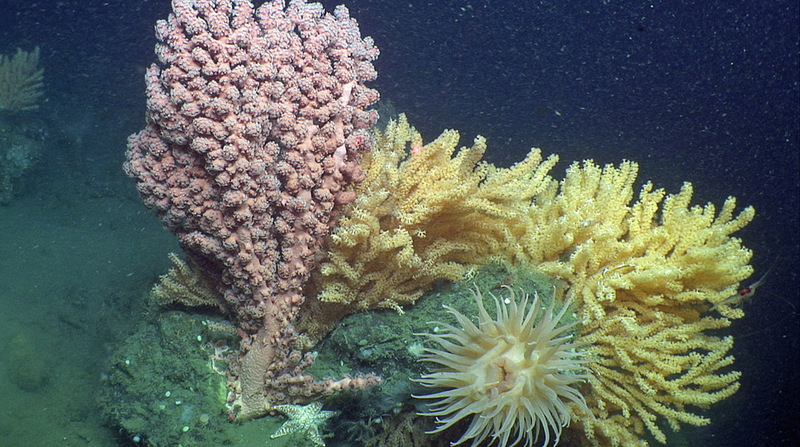 This area encompasses a variety of different habitat types, including submarine canyons, cold-water coral mounds and gardens, methane seeps, and soft sediments. Specifically, this project will explore and characterize the biological communities of the study area, examine the sensitivity of habitat-structuring fauna and associated communities to natural and anthropogenic disturbance, and describe the oceanographic, geological, geochemical, and acoustic conditions associated with each habitat type. This study will improve our understanding of the habitats and communities in offshore areas of the Atlantic Large Marine Ecosystem and will contribute to the environmental information needed to address current and emerging science and management issues, in particular with respect to the potential development of energy and marine mineral resources in the area. DEEP SEARCH is an initiative of the National Oceanographic Partnership Program (NOPP). Three federal agencies (BOEM, USGS, and NOAA), along with TDI-Brooks international, Inc. as the prime contractor and seven academic institutions, serve as partners in the project. NOPP is a federally mandated initiative that coordinates and develops collaborative ocean research efforts among Federal, state and tribal governments, academia, private industry, and non-governmental organizations. What's Next? In 2018 and 2019, the DEEP SEARCH team will complete two more expeditions to further investigate coral, canyon, and seep habitats. The best way to keep track of DEEP SEARCH activities is by following us on Twitter, Facebook, and Instagram. We will be primarily using the ECOGIG social media channels and the #DeepSearch hashtag. Press Release (Bureau of Ocean Energy Management), September 12, 2017: "Federal Ocean Partnership Launches DEEP SEARCH Study Off the Mid- and South Atlantic Coast"
Press Release (U.S. Geological Survey), September 13, 2017: "Federal Ocean Partnership Launches DEEP SEARCH Study of Coral, Canyons and Seeps Off the Mid- and South Atlantic Coast"